Huolong Valley is the home of some of the best and most beautiful landscapes in China and now we have the chance to see that beauty with our game from NextGen Gaming. Besides being paradise for the eyes, this area is also the home to some of China`s most ancient cities. 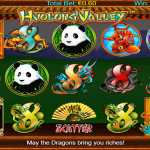 So a trip to there seems like very farfetched, but a trip to Huolong Valley video slot game is right in front of us. There are a couple of symbols in Huolong Valley that we would like to see more often. For instance the mask wild, which stands in for every other symbol except the other bonus symbols to complete a winning line. And not only that but it also comes with a x2 multiplier. The bonus symbol on the other hand is the key to the main feature, the free spins round. You need to land 3 or more Bonus symbols to activate the feature. 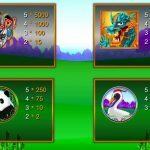 But before the feature starts you need to pick 1 of 6 lanterns to receive the number of free spins, and then you need to also pick 1 of 6 coins to determine the multiplier. 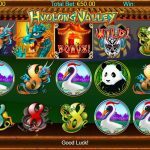 It is possible to receive between 4 to 7 free spins and between x3 and x6 multiplier here. Huolong Valley besides the interesting story does not have anything innovative in particular. But Nextgen Gaming did that for a reason. They wanted to pay a tribute to such an important place in China’s history and to allow players to enjoy a simple yet entertaining game. The fact that this game has one of our favorite special features is a reason enough to give this game a chance. We believe that you should do the same too and see it for yourself. For another great engaging game you should consider playing Hot Roller a 5 reel slot by NextGen.